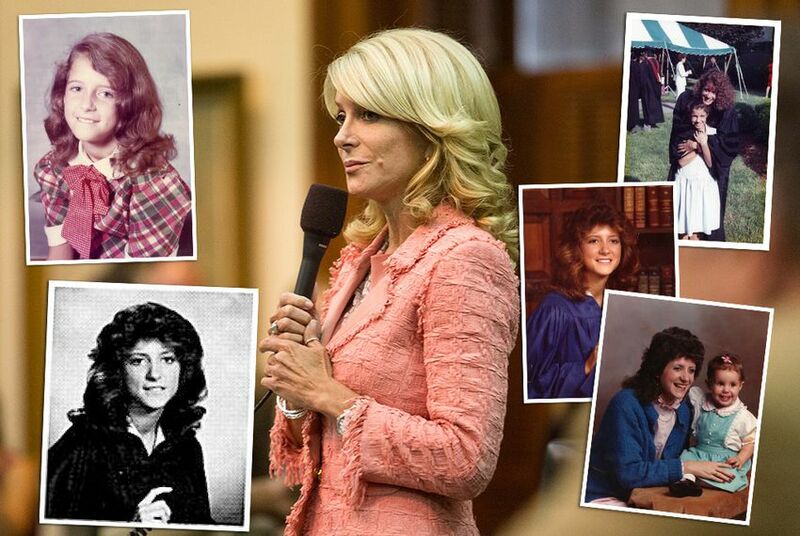 If Wendy Davis runs for Texas governor, her biography will face greater scrutiny. Voters are likely to find an exceptionally ambitious woman who has experienced both poverty and wealth and isn’t nearly as partisan as some think. FORT WORTH — Wendy Davis burst into the national political consciousness this summer as a feminist folk hero. She was a titan in pink tennis shoes, a single mother who became a lawyer, stood up to the Republican boys club and, against all odds, temporarily halted enactment of a restrictive abortion bill. Last week, a different side of the Democratic state senator emerged: the devoted daughter of an ailing father, Jerry Russell, who is well known in Fort Worth theater circles but isn’t mentioned in her compelling campaign biography. Her mother, a sixth grade dropout who made do without child support, is the one who figures prominently in the back story that inspires Davis’ followers. As it turns out, Davis’ story is more complicated and nuanced than legend would have it. That is not altogether surprising. Getting to know people, even famous ones, takes time. But Davis — whose moribund party badly needs a superstar — rode a filibuster into the political stratosphere, and now her supporters are all but forcing her to run for Texas governor. If she does, her biography will fall under a more powerful microscope, and what voters are likely to find is the story of an exceptionally ambitious woman who has experienced both poverty and wealth, isn’t nearly as partisan as her detractors might think and was shaped as much by her single electoral defeat as the unbroken string of victories ever since. Davis, 50, has both accused opponents — and been accused by them — of loose ethics. She has fought lonely battles against powerful, moneyed interests, and she has enthusiastically joined them in common cause. Through it all, Davis says she’s never forgotten where she came from. In a candid sit-down interview recently at the Fort Worth hospital where she has rarely left her father’s side since he fell ill a couple of weeks ago, Davis said hardship has defined her. When Davis moved to Fort Worth in the early 1970s, her dad still had a good job at National Cash Register, and she never had to worry about clothes or school supplies or the electric bill. But at age 11 her parents divorced. Then her dad, a starving artist type, quit his job to pursue his dreams in community theater. Soon his child support payments dried up and the family finances took a nosedive. To cope, Davis' mother, Virginia Russell, forbid use of the air conditioner until June 1 every year and kept the thermostat at 78 degrees. Gone, too, were the school shopping trips, dining out and health insurance. Davis herself went to work at age 14, selling newspaper subscriptions and later waiting tables to help make ends meet. Still, Davis excelled in her studies. She graduated from Richland High School in 1981 as a member of the National Honor Society without breaking much of a sweat. Her personal life was something of a mess, though. Between her junior and senior year of high school, to her mother’s horror, Davis moved in with her boyfriend, Frank Underwood, a construction worker. Then she got pregnant, and had a hasty marriage, right out of high school. In 1982, at 19, Davis already had an infant daughter and was working two jobs — one at a pediatrician’s office and the other as a waitress at her father’s dinner theater, Stage West. The young couple had bought a trailer on credit and moved it to Lakeview Mobile Home Park, which had neither a lake nor a view. They were so broke they couldn’t afford the skirt that, per the rules, was supposed to cover the bottom of the trailer. The marriage didn’t last long. They split up after a year and Davis walked away from the mobile home mortgage and moved back in with her mother. She said Underwood paid child support for a while but she still struggled financially. That changed after she went to junior college and met Jeffry Davis, a lawyer and former Fort Worth city councilman. Once the couple married, in 1987, Davis never had to worry again about putting skirts on trailers or braving the Texas heat without air conditioning. Their daughter, Dru, was born in 1988, and after Davis graduated from Texas Christian University at the top of her class in 1990, she set her sights on Harvard Law School. Even with their considerable resources the Davises pushed the envelope: She said her husband cashed in his 401(k) and eventually took out a loan to help pay for tuition and rent an apartment in Massachusetts while still paying the mortgage on their spacious Fort Worth home. Davis graduated from Harvard Law with honors in 1993. Her first brush with political activism came in the early 1990s when she opposed expansion of the popular Fort Worth Zoo, whose plans to use green space for a parking lot had the support of powerful downtown interests, including members of the billionaire Bass family. But it irked Davis and her aesthetic-minded neighbors in Mistletoe Heights, a historic neighborhood perched on a bluff overlooking the Trinity River. Exhibiting a taste for political combat, she brought the zoo battle into her first race for a seat on the Fort Worth City Council in 1996, when she said a prestigious law firm, which represented the Basses and zoo interests, had declined to make her a job offer because of her activism on the zoo issue. She lost the race by 90 votes, but Davis wasn’t done fighting. A few months later she sued the Fort Worth Star-Telegram, alleging that biased coverage led to her defeat and caused injury to her physical and mental health; the suit was later dismissed on free speech grounds, according to news accounts in the hometown paper. The election loss stung. A lot. But after she cooled down, Davis realized there was a valuable lesson to be learned. Davis spent three years learning the issues and meeting the key players in the diverse Council District 9, which encompasses both fabulously wealthy and dirt-poor neighborhoods. She won the seat when it opened up again in 1999. At City Hall she developed a reputation as both gutsy and pragmatic. She publicly pressed the oil industry, eager to cash in on a vast urban slice of the Barnett Shale gas field, to change what she saw as one-sided lease deals in minority neighborhoods. Today she admits opposing the freeze was politically unwise, but she says she’d do it all over again. After all, with no means testing, she said, Fort Worth billionaires like Sid Bass would benefit while struggling residents who weren't yet 65 would have to carry the load. In her council years Davis also courted developers and promoted public-private economic development projects, sometimes to the consternation of liberals. She has courted wealthy businessmen, too — including Bass, who has given her $200,000 in the last two years, making him one of her biggest donors, campaign records show. In 2003, as Davis’ political career soared, her marriage fell apart. After Jeffry Davis filed for divorce, Wendy Davis traded their 4,300-square-foot home for a one-bedroom apartment. The house, which was in her husband’s name, is where Amber and Dru had grown up and that’s where they wanted to stay, their mother recalled. The final, agreed-to divorce decree in 2005 gave Jeff Davis primary custody of Dru, who was then 17, and Wendy Davis agreed to pay $1,200 a month in child support, records show. Having grown up without the benefit of child support herself, Davis said it was the right thing to do. In 2007, after nearly a decade at City Hall, Davis set her sights on the Texas Senate, where polls showed GOP incumbent Sen. Kim Brimer to be vulnerable. When her name popped up, though, many wondered what party Davis belonged to. She had voted in the GOP primaries in 1996, 1998 and 2006, and Davis had also given at least $1,500 to U.S. Rep. Kay Granger, R-Fort Worth, records show. Davis won in both 2008 and 2012 despite the GOP leanings of the district. Her crossover appeal has given Democrats hope that Davis can reverse the long statewide losing streak for Democrats in Texas. Texas Republicans scoff at the notion, but they’re prepared just in case: Besides the anticipated focus on her relatively liberal Senate record, Davis, who portrayed Brimer as an ethically challenged good old boy in 2008, can expect to be criticized on ethics-related issues herself. Among them is her firm’s contracts with public entities, including the North Texas Tollway Authority, and her partnership with Brian Newby, Gov. Rick Perry’s former chief of staff and now a registered lobbyist. Davis is being pro-active. She’s promising to put her law practice on hold if she runs for governor, and if she wins she says she’ll give it up altogether. In the meantime, she said in the Tribune interview that she plans to ask her public sector clients to waive attorney-client privilege so she can publicly release a list of them. She has previously resisted calls to disclose her client list. She said she’s never let her private legal work conflict with her job as a legislator, for which she is paid a part-time salary of $7,200 a year. But with the spotlight growing ever hotter, she’s itching to defuse the issue with more disclosure.